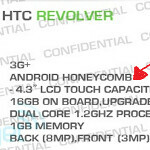 Is the HTC Revolver a Honeycomb flavored flagship smartphone for AT&T? A tipster for Engadget has brought forth a picture of a device that might be AT&T's new flagship model. 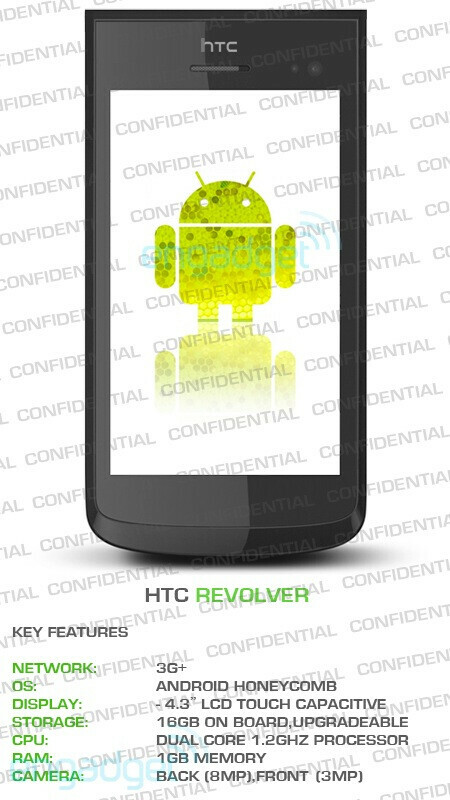 The device is supposedly named the HTC Revolver and according to the tipster, this phone will be running on Android 3.0. That's right, the same Honeycomb build that was supposed to be optimized for tablet use will be running the show. The specs are certainly high-end. Under the hood will be a 1.2GHz dual-core processor and the Revolver will be sporting a 4.3 inch display. An 8MP camera is on the back, and on the front will be a 3MP camera. There is 1GB of RAM on the phone along with 16GB of memory on-board. The tipster says to expect this model to be launched sometime in Q3, but did not mention any possible price for the phone. He did say that this spring, AT&T's web site will show the device as "coming soon". If true, the Motorola ATRIX 4G might have a very short reign as AT&T's flagship model. Not really a reason to switch, considering both AT&T and Verizon will have LTE. Nice specs but a fake phone. Seems like an HTC fan boy made this cuz of the Atrix... lol.... fake man. read comments on article. Can't wait for the Atrix!